The consultation on the options for the Winstanley and York Road estate will be formally launched this weekend. It is the first step in a process that will, ultimately, lead to a regenerated neighbourhood in one of Wandsworth’s most deprived wards. Though what that will actually look like depends on the outcome of the consultation; something I don’t want to prejudge. My involvement in the Winstanley and York Road master-planning exercise (along with my involvement in the similar exercise taking place in Roehampton) has been one of the most interesting periods of my time on the council, and certainly one of the most exciting, since it is likely that the scale of change will not have been seen in Wandsworth since some of these estates were built. That creates an interesting paradox. If we are to look at large housing estates, or collections of housing estates (there are actually three distinct council estates and the private Falcons Estate on the island formed by Plough Road, York Road, Falcon Road and Grant Road), and decide that they ‘don’t work’ we must also accept the possibility that anything we do to improve might well face the same accusation ten, twenty or thirty years from now. The past year has been the first time I’ve wandered around the estate actually looking at what the original architects were seeking to do and not knocking on doors or delivering leaflets. While it’s easy to criticise the design of council estates the country over you cannot avoid the fact that none were designed or built (or at least I hope none were built) by planners, architects or councillors who were seeking to make people miserable or compound deprivation; they were all looking to make life better for the residents. You can imagine how the original planners must have envisioned the original York Road estate, with roomy flats in big blocks surrounded by green spaces. Or how Pennethorne Square would have been a small town square. 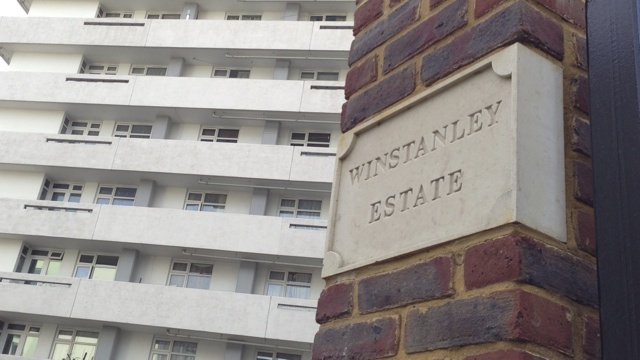 Or how the smaller scale of some of the Winstanley estate blocks came closer to replicating the old street pattern. But it’s also easy to see how the mistakes were made. The big open spaces are uneven because they were used to hide the rubble from demolished houses and where they are flat, games were prohibited, so they were nothing like the gardens the flats lack. Pennethorne Square has no active usage on several sides, meaning there was nothing there to give it vibrancy and life. And community safety issues meant the surviving street pattern in the Winstanley became constrained in a bid to reduce crime. But these are only my opinions. In all my meandering around the estate I learnt two things: first, I’m always pegged as being ‘from the council’ (this even happened when I was in jeans and a t-shirt wheeling a push-chair around) and second, that everyone there has a different opinion. I once found myself refereeing a friendly argument between two women, one from York Road and one from Winstanley, who both felt that all the good bits of the estates were in their estate, while all the bad design features existed in their friend’s estate. The consistent feature of all the discussions was a sense of pride in their neighbourhood, even though they could see faults and recognised the estates were not all they could be. We’re now starting a process that will help the neighbourhoods realise their potential. We hope it will result in improvement, huge improvement, for the residents and the wider Wandsworth community. Lessons have been learnt from decades of estate building, and decades of estate regeneration elsewhere. And consultation is at the heart of the process, because we cannot forget that this is a scheme that will affect people’s homes and lives. It is still at the beginning of the process, and as the options are discussed and refined and a preferred option emerges, it is clear that won’t find a solution that will please everyone, but I hope in a few months time we are closer to something that has majority support and in which everyone involved can take pride. Its high time The York Road received a radical regen, I personally can only see major benefits, and have faith this major plan goes ahead, as a long standing resident and community figure, I have faith this regen will happen.